H has always been a voracious consumer of books. Many the afternoon was spent reading up to 20 picture books in a sitting and it became even more the case once he’d given up his afternoon nap. I loved reading to him, but sometimes when we got past 10 or 15 books I’d start to find it harder work: my throat would start to become sore (even if it hadn’t been to begin with) and I’d start thinking about all the jobs I needed to get done. I’d carry on though and I’m glad I did because he is a great reader now. A friend of mine had great success with audio stories for her children, but we never seemed to have the right thing in the right place to play them. Plus H does like to wander around when he is listening to music or reading a book, so I think something portable was probably the right option. We were sent the Lunii My Fabulous Storyteller to try out: it’s super easy to use and set up. 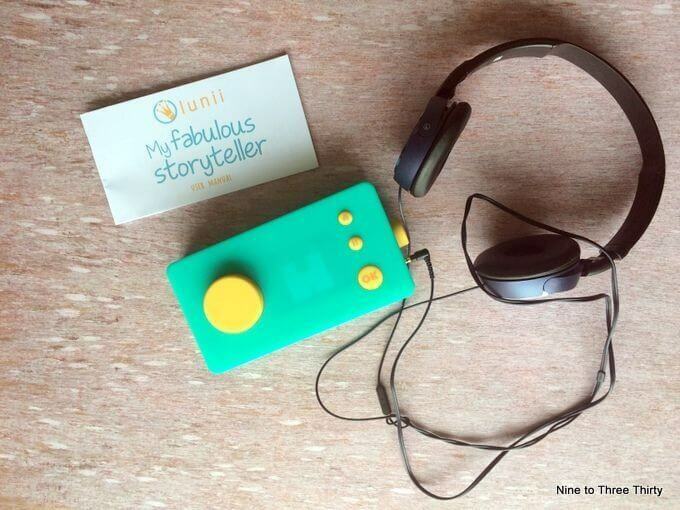 The Lunii My Fabulous Storyteller is a really great idea for a children’s gadget. It’s a brightly coloured, simply designed box that allows children to create their own stories and then they can listen to them while they are read aloud to them. There’s an easy to follow instruction booklet included, but really it isn’t that necessary because it’s so easy and instinctive to use. 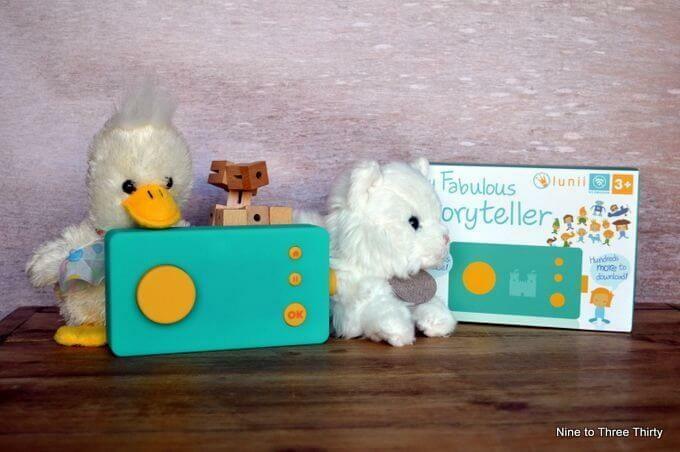 The My Fabulous Storyteller box is rechargeable with a USB cable so you won’t be constantly buying batteries. We were able to get started straight away because it had some charge when it arrived. It doesn’t seem to run down too quickly and it’s really light to carry around (and of course, it’s portable because of that built-in rechargeable battery, so we will be able to take it on long journeys or on holiday. The Lunii box has a turn dial on the side that turns it on or off and adjusts the volume. As soon as you turn it on, My Fabulous Storyteller starts talking to you and asks you questions like who will the hero be in your story or where is the story set. 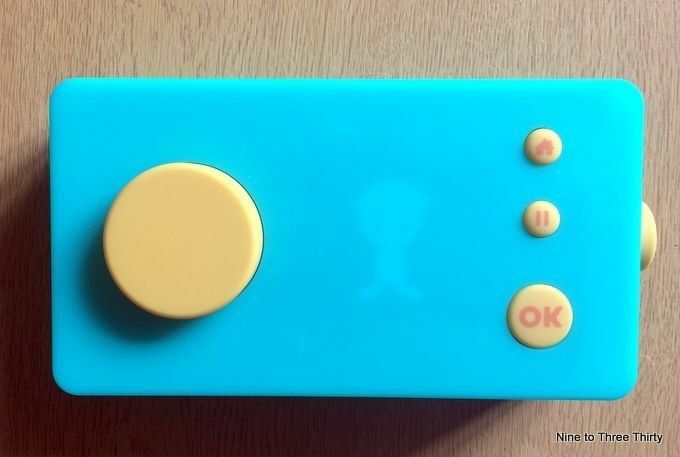 It also gives you instructions like telling you to press OK which makes it easy to use – there are so few controls that even a non-reader will quickly work out which ones which. You are given options and can turn the big dial on the front of the box to cycle through the choices, you just press ok when you’re happy with what you have chosen. When you have answered all the questions My Fabulous Storyteller starts to read aloud to you the story that you’ve created. There are usually four different questions and so many variations of answers that each story is so completely different from the last. The range and scope of the stories is large and so far we haven’t had a repeat. It’s nice to have an English voice telling the story, rather than an American one. The voice is clear and easy to understand and there are put on voices for different characters, just like you would do as a parent if you were reading (although probably a lot better than my voices if I am honest). My Fabulous Storyteller comes with 48 stories, another six free goodnight stories with the application (you just register for this online) and hundreds more stories that can be downloaded from the LuniiStore. I’ve taken a bit of a look through the LuniiStore and found that you can get 18 stories for around €10, which I think is good value compared to buying books or audio books. I don’t see the Lunii as a replacement for reading to your child – you can’t beat a bedtime book and snuggle with Mum or Dad, but I do think it provides another entertainment tool that isn’t screen-related. Also, it’s a good way to keep children entertained whilst you are preparing tea or whatever you need to get on with. Lunii’s My Fabulous Storyteller is something different. It would be useful and fun for lots of families. My Fabulous Storyteller has an RRP of £53.90 and you can find out more on their Facebook page. Update: Since I wrote the review my niece and nephew have been enjoying Lunii’s My Fabulous Storyteller – they are 3 (nearly 4) and 6. It’s been a big hit. My 6-year-old nephew has taken it into school to show his teacher. My sister-in-law, an infant teacher, is very impressed with it and thinks it could be a good school resource. Further update: My nephew’s school are going to buy one or more and my sister-in-law is going to take it into her school to see if they want to do the same. Disclosure: I was sent this product for the purpose of this review and compensated for my time, however all opinions are my own. My nephew is enjoying it and he’s 6 nearly 7, but my niece likes it too and she’s 3 nearly 4. I love audio-books as does my eldest grand-daughter. The Lunii My Fabulous Storyteller would be perfect to introduce the younger children to the fun of listening to a story quite apart from its usefulness to busy parents. Wow, that sounds amazing! My girls are always making up stories so would love this. My son loves audio books and they are are great wy to improve his vocab as he struggles with reading (and despises it) . We think he has dyslexia and i can see these would work really well in a school.